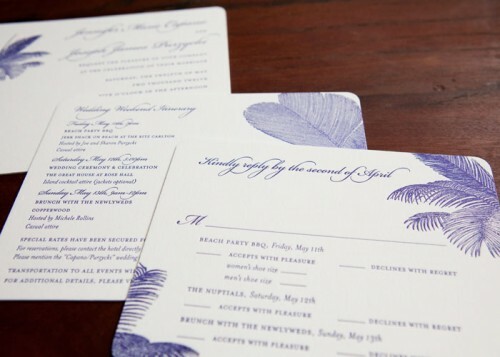 We often collaborate with couples to design invitation suites for destination weddings. One of the fun challenges is to develop a design that complements the setting of the wedding but also maintains the style of the couple. 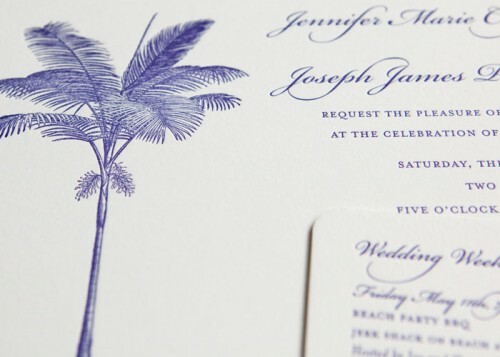 For this Jamaican invitation suite, we worked with a selection of vintage palm tree images and printed everything in a rich blue ink. The darker ink and one color printing give the set a sophisticated look, which was fitting for the stylish (and really sweet) couple.